My fingers can take it. The nixie tubes I was playing around with have a startup voltage of 170V. That really has an interesting affect on your fingers when you touch that. hoglet wrote: If you are feeding the board with 12V, then the 7805 is going to be dissipating 770mW. The ST L7805 I used has a thermal resistance of 50°C / Watt without a heatsink. I'm not sure that's quite correct. The thermal resistance (for a device) is usually quoted as chip to ambient in free air so in this case the CHIP temperature would be 59.5 (with the case temperature unspecified). This is only very rough though as airflow round the case is pretty uncertain. I'm not sure that's quite correct. The thermal resistance is usually quoted as chip to ambient in free air so in this case the CHIP temperature would be 59.5 (with the case temperature unspecified). This is only very rough though as airflow round the case is pretty uncertain. You are indeed correct there. Can you calculate the "case to ambient" by subtracting the two figures, giving 45°C / Watt? Yes, thermal resistances are additive just as for electrical resistances. The difficulty with a package is that it's not likely to be uniform although the metal tabs are generally continuous from the chip substrate so not much of a gradient there I guess. 1024MAK wrote: This may be a suitable heatsink. Those heatsinks make a huge difference. Runs much cooler now. Hey, I was just wondering how many of you guys with BeebSIDs are grounding the input to the SID chip. The SID input pin (#26) was a source for noise on the C64s, and one of the tricks to reduce that was to ground it, thus improving the sound output. Apparently this floating input picked up a lot of interference. I believe there's a jumper for it on the BeebSID board. Recently discovered this in the C64 literature. Last edited by Holmes on Sat Oct 29, 2016 11:48 pm, edited 1 time in total. On the Mk2.3 board design (which is what I based my board on), pin 26 on the SID is linked to a 2-pin header for connecting an audio input. The other pin on the header is connected to ground, so I presume it should just be a matter of throwing a jumper on that header which will ground the SID input. I saw on one of the completed board pictures, a pull-down resistor soldered across the top of the SID from what looks like pin 26 to pin 14 (GND). I just connected pin 26 directly to ground on my board, without a resistor, so I hope that approach is okay. Seems to work well, because I found the sound to be very clean playing through the BBC speaker on mine. Ok, fog clearing now... I left it untracked (probably just forgot in the end!) 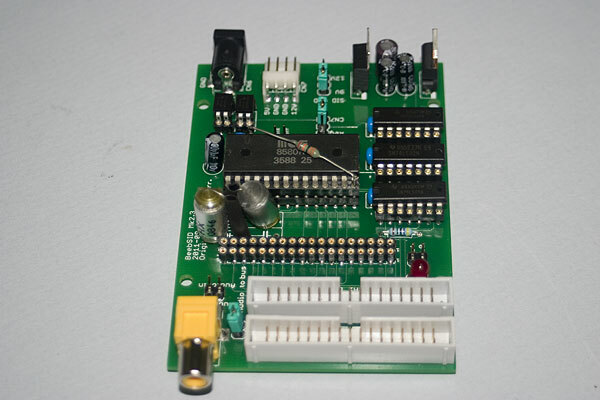 whereas on the second batch of boards, Phill added an input connector with an option to ground the line. Because there was no track on the original boards, there would be very little chance of picking up stray noise and any issues with the C64 implementation shouldn't necessarily be assumed to read across to BeebSID. It's generally where there's a length of unterminated PCB track to an input that noise pick-up problems can arise because the track can act as an antenna and this was seemingly the case with the C64. That all said, there's certainly no harm at all in adding a resistor (ideally) or a ground short, the input impedance is apparently around 100k, but a quick 'quiet' test on mine (no resistor etc.) certainly shows no pick-up. Ok, that makes sense. No trace, no antenna effect. The c64 connected the SID input all the way to the external audio/video connector. Holmes wrote: Hey, I was just wondering how many of you guys with BeebSIDs are grounding the input to the SID chip. The SID input pin (#26) was a source for noise on the C64s, and one of the tricks to reduce that was to ground it, thus improving the sound output. Apparently this floating input picked up a lot of interference. On the Mk2.3 version board (picture here) pin 26 is routed to a pin header ("Audio in") but I don't have anything connected to this header. So pin 26 floats. The track is not very long. I can't hear any noise, so I don't think it matters. One thing you can't see in that picture, is the added resistor on the track side between pin 27 and 0V/GND. This is the audio output bias that was talked about in this post. Normally when using my BeebSID, I connect it to an external audio amplifier via the "Audio out" pin header. The best of 80s electronica... The Pet Shop Boys! I just got my first beeb. A Master, to be precise. It worked just fine for about 15 minutes, then *fizzle* *pop and white smoke to signal the new popes divine appointment. Changed the exploded cap (and all other caps prone to failure) and I'm back in business. Found this outstanding community and of course this very cool BeebSID device. Being an old C64 guy, this is a must have for me. Now, the questions is are there any PCBs left? I suspect the answer to be no, but no harm in asking. storhemulen wrote: Found this outstanding community and of course this very cool BeebSID device. Being an old C64 guy, this is a must have for me. Now, the questions is are there any PCBs left? I suspect the answer to be no, but no harm in asking. I have a few left, send me a PM and I'll let you know costs etc. May not reply till next week tho, as I'm going to be away at the Acorn meetup over the weekend. If you can't PM yet, I'm sure Daniel will be along presently to enable it for you. If you've got a second and a third unit, I'm interested too. I finally tried setting up the beedsid that came with my Master. It needed a new 8580 and a 34 pin idc to daisychain the beebsid ahead of the datacentre. Lk2 is south for a 9v SID. I'm assuming the power lead goes the way I connected it as the connector wouldn't fit the other way round! Unfortunately I'm not getting any audio from it. I've tried the beebsid5a Movies ssd in DTRAP mode. I've also tried the lk1 jumper to see if audio will come from the Beeb speaker but I still don't get anything. With the old dead 8580 in place the datacentre ram drive won't initialise with power applied to the beebsid. With the new 8580 installed the datacentre works fine with power applied to the beebsid, so I think the new 8580 is ok.
Re: BeebSID Disk#18 - Club Hits! PitfallJones wrote: 26 Massive Tracks Remixed for the SID! Thanks, some top tunes in there, though some of the renditions are rather dubious. Is BeebSID still available anywhere? This would be so awesome! I think RobC has some PCBs still? danielj wrote: I think RobC has some PCBs still? Just checked - I now only have four PCBs here but 3 are spoken for (bagpuss x 2 and trixster x 1) and I had intended to keep one for myself. However, somewhere I definitely have another bare PCB from the initial run but it has already evaded several of my attempts to locate it! Cosmo wrote: Is BeebSID still available anywhere? This would be so awesome! I have ordered and received all the parts now for the board I got from you RobC. Possibly a job for ABUG solering them up, although I ahve so many things on my todo list. The parts come to about £20 - the PCBs are free if you want to source them and build it yourself.